dataviz | Web 2.Oh. . .really? Not long ago I castigated Congressional Quarterly for presenting high-quality reportage on political polling via a blog. They’re missing a great journalistic opportunity–to present daily analysis of the latest state-by-state Obama vs. McCain polls in a way that takes full advantage of the interactive visual medium that is the new platform for journalism. It’s a classic case of old media not understanding what to do with their great stuff. Failing to “unlock the value” of their work, as they say in the corner offices. Anyway, I’ve since discovered that such a map–a dataviz, or datavisualization, in web argot–exists. Unsurprisingly, it’s the work of a new media firm unburdened by an analog heritage. The map is produced by RealClearPolitics, an online-only political analysis operation. The map is a thing of digital beauty, a tool that lets you dig into good polling data smartly analyzed and interact with it by imagining various scenarios. You can base all of these scenarios on the latest polling data so you can see how realistic your own speculations are. It’s great work, a simple dataviz that presents best-of-class information in a fully interactive way that delivers a very high level of public service. It’s “civic engagement” on a screen. If old media doesn’t start winning this kind or race soon, there will be no doubt who will carry the contest for the media future. I often write about great datavisualizations–applications that use interactive graphics to illuminate a database in inventive ways. A great dataviz explains stuff in a way words alone cannot. Today I’d like to pay tribute to one of the worst data presentations of the political season: Congressional Quarterly’s Poll Tracker. Let me say first that it’s a great idea to take the most recent state-by-state presidential polling data from the most credible sources and update it daily. Put some experienced reporters on it so they’re not fooled by bogus numbers. This will produce an electoral map showing the latest polls in all 50 states. What more could an obsessive horse-race watcher ask for? I thought this presentation looked eerily familiar. Then I recalled the two-year mobile broadband service contract I signed over the weekend. You know the way they print out those contracts on long receipt tape? And they have to fold it over four times just to get it in the bag? That’s what the CQ “dataviz” reminded me of. This is a classic case of journalists not understanding that how you present data is just as important as the underlying data itself. Stick that daily-updated state-by-state polling data on a map, float the data on flash pop-ups and you have a powerful application, a real reader service and eyeball draw. Leave it in a blog and all that reporting. . .turns invisible. To be fair, CQ does have projection data on a map for House, Senate and Governors races. It doesn’t appear to take the most recent polling data into account, but it toggles neatly between current landscape and projected election outcomes. Oh, wait, look! There is a “President” map that presents the latest polling data! My mistake! 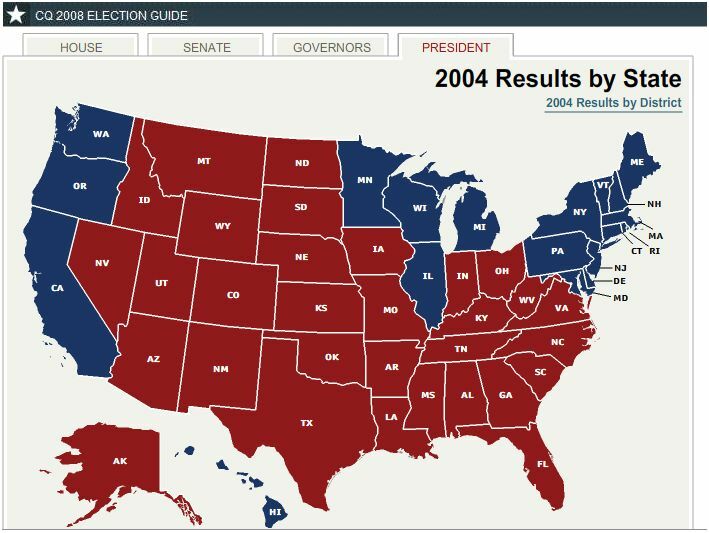 Oh, never mind. . .that’s the results from the 2004 election. I’ve often yammered about how the rapid development of datavisualization–things as simple as timelines, as nutty-cool as you see in Digg Labs or as brain-stretching as in the gallery at Visual Complexity–will be culturally transforming. By allowing people to see relationships dynamically, over time and in multiple dimensions, dataviz tools surface new understandings and ideas invisible via words and images alone. It will help us see obvious stuff that’s been hiding right under our cerebral cortexes for centuries. The rise of dataviz technology will unloose the vast intellectual capacity of people who think visually and spatially but maybe aren’t so good with words or numbers. But there I go, yammering again. I came across a new dataviz tool that lets you brainstorm visually. It’s fun, it’s functional, it permits easy collaboration. It may change the way I handle projects and problems. bubbl.us is a tool that lets you plank out ideas and chunks of information in “bubbles” and show how they relate to each other. It’s essentially a dynamic, flexible whiteboard. It’s a freeware version of something called “brain-mapping” software, the expensive forms of which are used by businesses, universities, consulting groups and other serious thinky outfits with big budgets and high-stakes projects. By allowing you to “see” ideas and how they relate to each other, it supercharges the brainstorming process. This is nothing exotic to look at. But I’ve done hundreds, maybe thousands of these brainstorming things on paper or whiteboards, and this is better. bubbl.us captures ideas quickly, lets you move stuff around endlessly and accommodates those “oh, yeah, I almost forgot!” and “hey, what if we just. . .” brainstorming moments. Stick something in the wrong place and then move it. Kill a bubble and a cool little puff of smoke pops up. When you suddenly see connections, you can draw lines or simply re-position a group of bubbles. Bubbl.us is a work-in-progress, still funded with PayPal donations with a new beta expected soon. There are certainly competitors. Exploratree invites you to use thinking templates, but they strike me as PowerPointlike braintraps. Mindmeister makes me work too hard and is very word-heavy, but has lots of features (and a 2.0 version imminent). Meantime, I like bubbl.us. I’m hoping it liberates my own vast, undiscovered intelligence and unlooses it upon the world. But I’m guessing it’ll maybe help me brainstorm more efficiently. That’ll do. This week’s Print ‘n’ Read feature–my recommendation for an online article so worthy that you might actually want to print it out and read it offline–is rich with irony. It’s a 74-page PDF about the future of journalism–as seen by the people who are running newspapers. It’s tempting to dismiss this report, from the Project for Excellence in Journalism, with a consider-the-source wave. But the report [“The Changing Newsroom: What is Being Gained and What is Being Lost in America’s Daily Newspapers?”] is based on a thoroughgoing study based on face-to-face interviews and legit-survey-style questionnaires sent to newspaper leaders. It’s at least an intellectually honest attempt by journalists to assess what’s happening to them. As a result, it’s less idiotically defiant and self-serving than many similar efforts. The people surveyed seemed downright chastened. I’ll spare you the details, but it’s full of stories of optimism and ambition and furious attempts at innovation, all against the backdrop of a breathtaking descent into financial ruin. My favorite oddball gem, so sweet and earnest and foolish you just want to pinch the cheek of whoever thought of it and send ’em to bed: Some unidentified newspaper tried to sell copies of its important investigative report on Amazon.com. I love playing with ComScore’s news releases. Everybody pays attention to the top of the list to see how the Big Dogs are doing. I like scouring for other details. Like this latest, from a list of Top 10 gainers over the last month. With a 30-day rise in traffic of 409 percent, the entry at the top is. . .GSN.com, home of the Game Show Network. Why the spike of such an inane property? Always hard to tell. But it’s worth noting that the economy’s lousy, and GSN gives out cash prizes. And its latest sweepstakes? You can win a $500 gas card. On the impossibly-cool datavisualization site Visual Complexity I found this gem, Voting Patterns Among U.S. Senators, which depicts voting relationships among U.S. Senators in 2007. It was created by the Human-Computer Interaction Lab at the University of Maryland and published this spring. The graphic demonstrates that Democrats tended to vote as a herd in 2007. The GOP? Not so much. And why is the senior Senator from Arizona hanging out in the middle, unaffiliated, with Sen. Sam Brownback? He was campaigning for President and didn’t vote much.